You are here: Home / Government / The Real Party – T.R.P. Today we introduce you to: The Real Party – T.R.P. 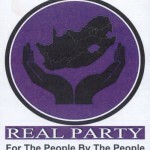 Click here to see ALL 2014’s registered national parties. Previous: The Promise Of Freedom – T.P.F.